Opening Friday, November 7, 2014, at 7 p.m., and on view through December 4, 2014, Counterpath hosted an exhibit of photographs by Patricia McInroy, “Cruzando Caminos” (Crossing Paths). The majority of the images were taken along the US/Mexico border between 2000–2007, when more than 1,000 people died trying to cross into the United States. The photos reveal the struggles of a population prevalent across the US but often invisible to the mainstream. Along with the photography, a video by Gonzalo Espinoza and Patricia McInroy will play. 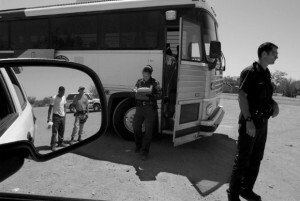 This piece features the community right outside the doors of Counterpath, many of whom are waiting on the sidewalk to catch a bus taking them from Denver back to Mexico..
Patricia McInroy is a photographer and videographer. A former photojournalist, her photography has appeared in USA Today, The Washington Post, Newsweek, US News & World Report, Runners World, Latino Future, and The Sun. She has screened her video work in more than 20 film festivals across the United States, Europe, and Latin America. Her work has also shown at galleries in Los Angeles, Santa Fe, Denver, Albuquerque, and Hartford. She currently teaches at Rocky Mountain College of Art and Design. Above video: Crossing Paths time lapse. Text on sidewalk outside Counterpath at the opening for Crossing Paths.